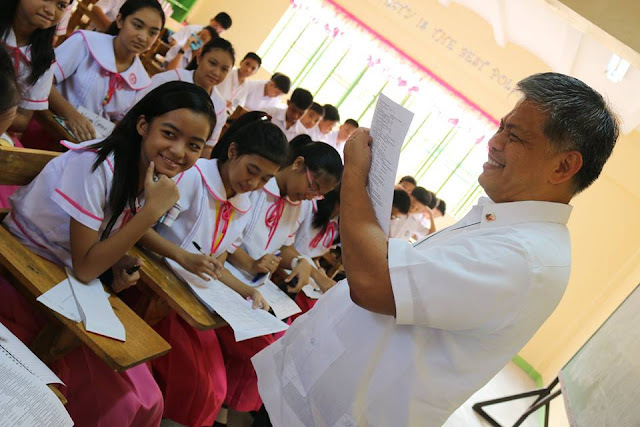 The Department of Education (DepEd) breached the 1 million mark reporting that 1,009,139 Grade 11 learners are now enrolled in Senior High Schools (SHS) nationwide. DepEd is expecting numbers to rise further since as of June 17, DepEd records show that over 1,600 schools are yet to submit and report their SHS enrollment data to DepEd. "Napatunayan ng Pilipino na handa tayo sa pagbabago. Nakatawid na tayo sa liwanag. Kaya naman pala ng Pinoy kung ating pagtutulungan," Education Secretary Br. Armin Luistro FSC said. Of the over 1M learners, around 691,000 SHS students are enrolled in public schools (DepEd-funded schools and public universities and colleges) and more than 317,000 are in private schools. DepEd's real time Learner Information System revealed that some 610,000 chose to take the Academic track; over 394,000 Technical-Vocational-Livelihood track; 2,728 are in Arts and Design track, and 1,537 in Sports track.